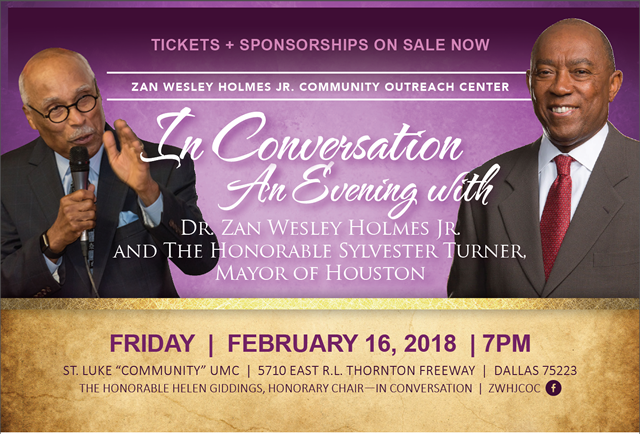 Prepare to be informed and challenged by Distinguished Guest Speaker The Honorable Sylvester Turner, Mayor of Houston, at the 5 th Annual In Conversation hosted by the Zan Wesley Holmes Jr. Community Outreach Center. Mayor Turner will join with the Legendary Dr. Zan Wesley Holmes Jr. at the annual fund-raising event being held for the Outreach Center at 7 p.m. Friday, February 16, 2018. The event will be at the St. Luke “Community” United Methodist Church, 5710 East R.L. Thornton Freeway, Dallas. In Conversation hosts a distinguished presenter each year who helps to shine light on the life and events of our city, state, nation and the world from the perspective of Dr. Holmes and the guest. The Honorable Helen Giddings is serving as this year’s Honorary Chair. Giddings says, "Mayor Sylvester Turner is one of our nation's most engaging, tenacious, and principled leaders. Never forgetting his humble upbringing in the Acres Holmes Community in Houston, Mayor Turner understands the intersection of opportunity and prosperity. His perspective on lifting up the disenfranchised and struggling families of our state is unrivaled and critical in today's world. Always speaking truth to power, he will inspire and challenge us to action." 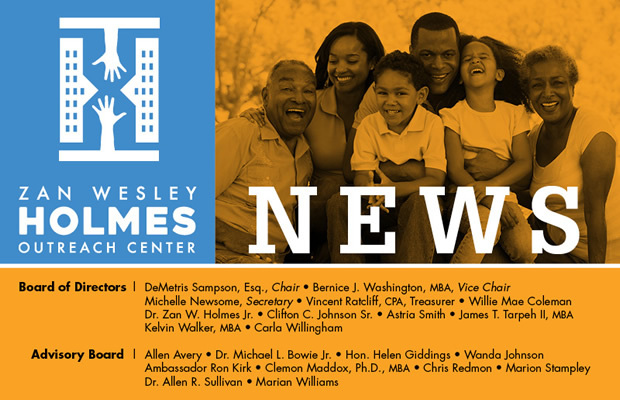 The Zan Wesley Holmes Jr. Community Outreach Center is a 501 (c)(3) nonprofit organization. Proceeds from this event, ZWHJCOC's largest annual fund-raising effort, support Frazier House and other ZWHJCOC programs, services and operations. For more information, contact Fannie Smith at 214.454.8624 or at inconversation@zwhjcoc.org .